At the end of the eighth century B.C., the Greek poet Homer wrote 'Odyssey', his follow-up to 'The Iliad'. These are two of the oldest pieces of literature in the western world. Since that time, other than a shock win in the European Championship in 2004, the Greeks have had very little to celebrate. That is, until now, as the Hellenic's are about to release a second Odyssey on an unsuspecting world; this one being Odyssey Desperado, a Melodic Rock project started by guitarist Odysseas Karapolitis in Athens during 2014. He enlisted the talents of producer Bob Katsionis (Outloud, Firewind), who also contributes bass and keyboards, vocalist Manos Fatis and, adding the icing on the cake, the legendary Paul Laine (ex-Danger Danger) on backing vocals. The quality of these ten songs has to be heard to be truly appreciated. 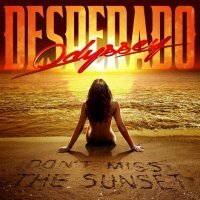 Odyssey Desperado have taken the melodic virtues from across the globe and produced a Melodic Rock gem. Just listen to the opening track 'Rush Of The Wave' and if you are not immediately hooked, I think you might be reading the wrong publication. 'You And Me Against The World' continues the melodic assault, whilst 'Cruisin'', 'Oasis (In The Desert Of Your Soul)' and 'Tomorrow You'll Be Gone' are feel-good AOR, similar to the songs found on last year's Brother Firetribe opus 'Sunbound'. The production and mix are both phenomenal and result in an immense sound, like a glorious combination of Survivor, Giant, Wildness and One Desire. Yes, it's that good! When the Greeks produce classics, they don't do it by halves; failure to pick up 'Don't Miss The Sunset' by Odyssey Desperado would be truly criminal. This should be the Melodic Rock soundtrack of the summer.